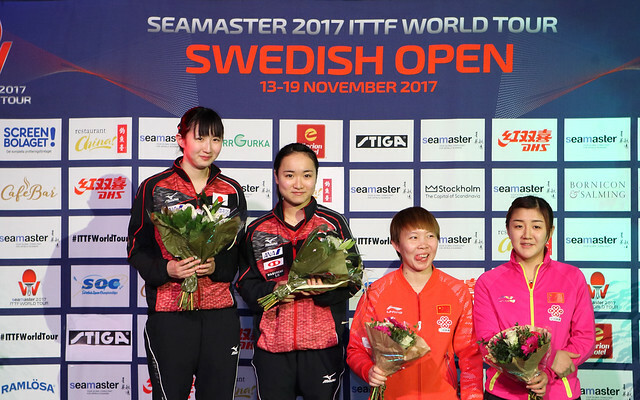 Close but not close enough; such was the pain for the host nation in the opening round of the Under 21 Women’s Singles event at the Seamaster 2017 ITTF World Tour Swedish Open in Stockholm on the morning of the first day of play, Monday 13th November. At the crucial stages, Asian adversaries proved too strong. A surprise win from a native to ignite the tournament; it was not to happen. Filippa Bergand secured the first game against Japan’s Miyuu Kihara but eventually the shorter, quick efficient strokes from the latter, who stayed close to the table at the crucial stages, timed the ball earlier than her Swedish adversary and thus controlled the rallies won the day. A four games Japanese success was the verdict (7-11, 11-8, 11-5, 11-7). Likewise, Ellen Holmsten caused Hong Kong’s Zhu Chengzhu more that food for thought; heavy top spin from the forehand reaped dividends; trailing two games to one and down by one point at 9-8, caused Chan Kong Wah, the Hong Kong coach, to call “Time Out”. The break worked; the end result similar to that of Filippa Bergand (12-10, 7-11, 11-8, 12-10). Equally Tilda Johansson gave her best against Korea’s Kim Jiho, the no.13 seed but suffered in four games (11-8, 11-9, 8-11, 11-2), whilst Christina Källberg stood level at two games apiece with Singapore’s Lin Ye, the no.6 seed. However, the worst possible start in the fifth game, she lost the first five points, signalled doom (11-13, 13-11, 11-6, 2-11, 11-5). Watching Filippa Bergand play and overseeing the efforts of the aspiring young women was Peter Sartz, the national coach. Defeats for Sweden but according to status no great surprises; however, there was one major upset and one minor tremor. Puerto Rico’s Adriana Diaz, the no.4 seed, was beaten by Oceane Guisnel of France (11-3, 7-11, 11-6, 11-5); Chinese Taipei’s Lin Chia-Hsuan, the no.15 seed, experienced defeat at the hands of China’s very powerful, Sun Mingyang (11-3, 11-1, 11-8). “Today everything was good, I found a rhythm to my play quickly and received service well; I played her three years ago at the Spanish Junior Open and lost. I think since then I am much more assured in my play, better in the open game, better in the rallies.” Oceane Guisnel. Problems for Adriana Diaz but there were no such travails for the top three names in the opening round of the Under 21 Women’s Singles event. Hong Kong’s Minnie Soo Wai Yam, the top seed, beat Germany’s Wan Yuan (11-5, 11-6, 11-5), Japan’s Minami Ando, the no.2 seed, defeated Russia’s Valeria Shcherbatykh (11-7, 11-3, 12-10); China’s Chen Ke, the no.3 seed, ended the hopes of Thailand’s Orawan Paranang (11-5, 11-4, 11-4).